Millennium Residence sits on a 2.4 hectare site in the Sukhumvit area of Bangkok, with views over the lake in front of Queen Sirikit International Convention Centre. 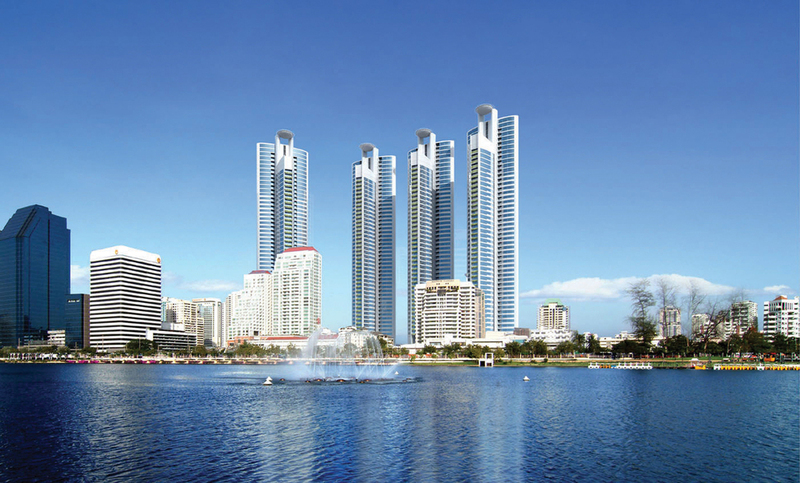 The four 53 storey (200 m high) residential tri-petal towers are built along a central curved axis, and each one is raised on grand structural columns that float the apartments above a landscaped park. 604 apartments range from smartly designed compact units to the duplex luxury penthouse with its own jacuzzi deck. Thanks to careful planning each apartment has views out on three sides, adding value and desirability to the development. The scheme also includes a state of the art clubhouse with sauna and steam rooms, function rooms, a swimming pool with a 50 m lap section, numerous sun terraces, a tennis court, a gymnasium, a children’s play area and a jogging track. The award winning Millennium Residence also became the first project in Thailand to receive a Green Mark Gold Accreditation from the Building Construction Authority (BCA) of Singapore. The BCA Green Mark Scheme promotes sustainability in the Asian built environment, raising environmental awareness among developers, designers and builders from project conceptualisation and design as well as construction.